Skunks are usually happy to mind their own business as they forage for food in the hours around dusk and dawn. Startle a skunk, however, and they may launch an odor offensive. 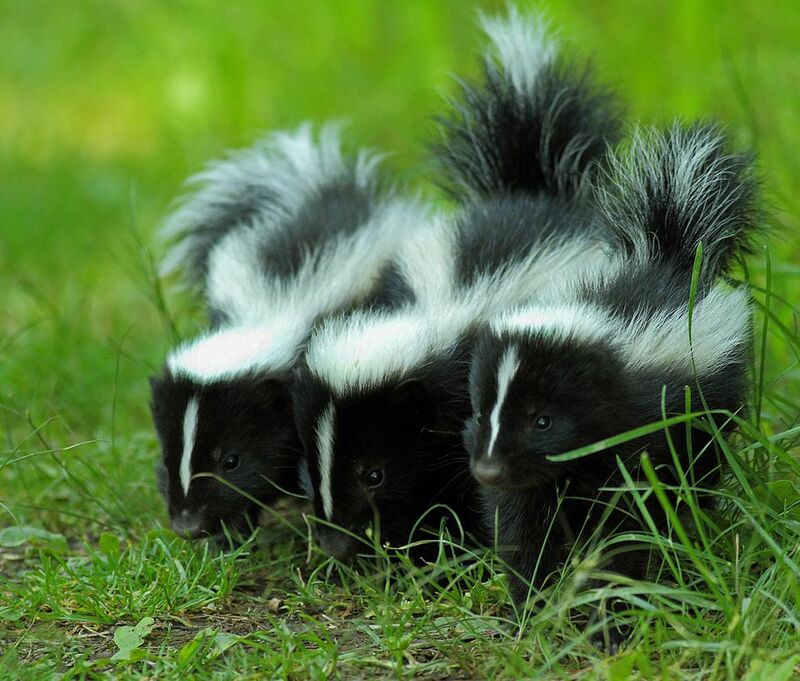 Getting rid of the bothersome skunk odor is one thing, but are there any medical issues to be concerned about if your pet is sprayed by a skunk? The answer is usually "no," but there are some things to watch for if your pet has been sprayed in the eyes or shows signs of injury. Animals, like humans, reflexively blink or close their eyes when something is coming at them, but skunk spray can happen fast. If you notice your pet rubbing its eyes, blinking fast (blepharospasm), or experiencing redness or tearing, they may have gotten some spray in their eyes. To apply first aid, flush your pet's eyes copiously clean water, ideally with sterile saline eyewash. Use over-the-counter saline eye wash, not solution for disinfecting contact lenses. Prevent your pet from pawing and rubbing their eyes to reduce the chance of secondary trauma. Follow up with a veterinary examination if your pet doesn't quickly improve. If the eye irritation continues, your pet may be suffering from the potentially caustic effects of skunk oil. Possible effects of skunk oil include corneal ulceration, conjunctivitis, or uveitis. All of these are painful eye conditions that require topical and medical treatment from your veterinarian. Thankfully, this is rare, but eye conditions can occur and change quickly. See your veterinarian as soon as possible if your pet's eyes seem uncomfortable. Skunks typically are sprayers rather than fighters, they do have sharp teeth and claws and can do damage if provoked. Check your pet for bites and lacerations after a skunk encounter, and see your veterinarian if you notice any wounds. Don't be fooled by a small wound—that may just be the part you can see, in the skin. Typically, bite wounds do a lot of damage underneath the skin and, if left untreated, can create a perfect environment for an abscess within a few days. Also, it is important to remember that skunks can carry rabies. Take necessary precautions (call your vet or human physician) and make sure your pet is current on their vaccinations. While rare, skunk spray can have toxic effects, sometimes causing death. The toxic effect occurs when victims are sprayed in an enclosed area, such as a burrow or den. Open-air sprays are far more common and not considered toxic. There have been reports of dogs collapsing or experiencing other problems after being sprayed in a closed skunk den. In addition, the May 2005 issue of the Journal of the American Veterinary Medical Association (JAVMA) describes a case of Heinz body anemia in a dog that had been sprayed with skunk musk. .